Temporarily remodelled to cover the needs of the Greek Presidency of the European Economic Community Athens, 1874-88 and remodelling 1982 Architects Theophilus von Hansen (1813-1891) François-Louis-Florimond Boulanger (1807-1875), initial designs Remodelling architect 1982: Vassilis Sgoutas (1934-) The Zappeion Exhibition Hall, one of the outstanding examples of late Athenian classicism, is one of the archetypes of Greek public architecture. 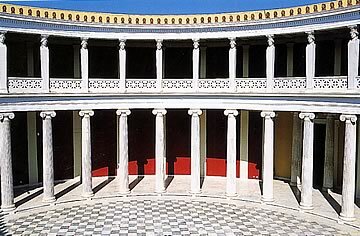 The purpose of the building, which was funded by Evangelis and Constantinos Zappas, Greeks from Romania, was to house an exhibition hall in conjunction with the first modern Olympic Games held in Athens. It was constructed in the region of the Ilissos River between the Temple of Olympian Zeus and the National Gardens on the site created by the committee of Olympians and with trees planted under the supervision of the French architect D. Matton. The original plans were by French architect F.-L.-F. Boulanger. They were however amended by the famous Danish architect Theophilus von Hansen, who also designed the Academy of Sciences and the National Library as well as a number of significant buildings in Vienna. 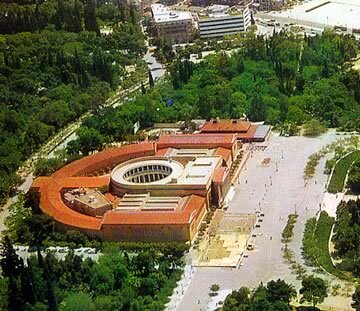 On plan, the Zappeion is symmetrically arranged around a circular atrium. The atrium adjoins the long front section which ends in two vertically placed smaller wings. These wings contain adjacent quarter-circle halls concentric with the atrium. The front façade has a three-part layout. It consists of the main, two-storey building with its Corinthian portico, and the two side wings that are adorned with pillars, rhythmically arranged openings and crowned with pediments. The layout of the interior is also interesting. The vestibule with its coffered ceiling leads to the circular atrium, which has a two-storey arcade with an Ionic colonnade on the ground floor and pillars with the heads of caryatids on the upper one. Walking through the building, one is struck by the fascinating alternation of open and closed spaces. 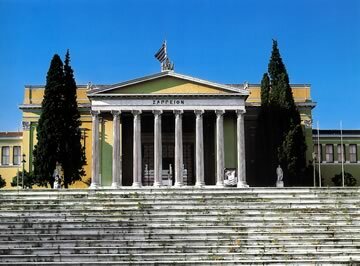 Zappeion Hall has been associated with significant events in Greek history. The highlights include the accession of Greece to the European Economic Community on 28 May 1979, and the temporary conversion of the building to cover the needs of the Greek Presidency of the EEC in 1982, based on plans by architect Vassilis Sgoutas.